Following in the footsteps of Keith Harwood's The Hardy Book of the Salmon Fly, this compact little volume is the best introduction to Hardy's reels as you could care to imagine. True, at 136 pages it can't be comprehensive, but as the author makes clear in the introduction, that was not his aim and David Stanley has instead presented his personal selection of the reels that made Hardy Brothers great. 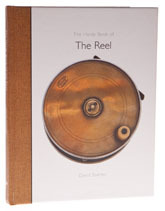 The book starts with a short introduction to the history of the reel and Hardy's contribution, before moving on to the main attraction - the reels themselves. Each spread presents the reel on the right and its history on the left, together with the production dates and all the popular reels are included, right up to the early years of this century. If you want a primer on Hardy reels, this book can't be beat and it would make a grand present for dad or grandpa (or mum or grandma, if they get the wish to fish). Sales have reflected this and the book has been reprinted several times. If you want a complete guide to every reel that Hardy ever produced, then John Drewett's magnificent Hardy Brothers, the Masters, the Men and their Reels is the one to go for, but this is six times the price, doesn't cover the firm's post-war reels and is for dedicated tackle heads only.